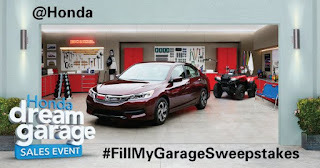 Pacific Honda Blog: Win A Honda Car Through Fill My Garage Sweepstakes! Win A Honda Car Through Fill My Garage Sweepstakes! There might not be any more satisfying feeling in the entire world than finally purchasing a new vehicle you’ve been considering for months and getting the opportunity to see how gorgeous it looks not only out on the road and in your parking spot at work, but in your in your beloved garage. In fact, Honda spent a good chunk of April pushing their Honda Dream Garage Sales Event, which gave Honda dealers like us here at Pacific Honda a perfect opportunity to knock some money off of our most popular models while also generating some of the more desirable financing deals we’ve had all of 2016 so far. But the only thing more enjoyable than buying a Honda for your garage is being gifted one for free, and right now San Diego Honda fans can win either a 2016 Honda CR-V Touring or 2016 Honda Accord Touring simply by doing a little amateur photography followed by just the bare minimum amount of social media use. More specifically, all you have to do is snap a picture of your garage or other location where you normally park your car, then post it to Facebook, Twitter and/or Instagram, tagging @Honda and using the hashtag #FillMyGarageSweepstakes. That’s all it takes to get yourself entered into one of the easiest contests in the history of the internet. Only one winner will be chosen, and the sweepstakes ends on May 2, 2016, so now is the time to get your cell phone out to start snapping pictures of your garage to send to Honda. Your mild-mannered car port could end up being a Honda Dream Garage in no time, and if you’re lucky you won’t have to spend a dime to make that happen!